The thing Patricia Donahue wants most for Christmas she can find only in photographs. The photos lie within a cabinet that she and her husband, Todd, had built in memory of their son Mason, whose life was cut short at 34 days, when he died of sudden infant death syndrome on May 23. The Donahues, who live in the Wardtown Mobile Home Park Co-op in Freeport, stocked the cabinet with photos of Mason smiling, his baby clothes and other possessions. Their daughter, Raelyn, 4, and son, Tripp, 3, see their little brother all the time. “I want to be able to remind the kids of their brother, so that they don’t forget him,” Patricia Donahue said. And now, as Christmas approaches, she said she has a far different point of view on the holiday. Donahue, 23, and her husband Todd, 25, will do their best to give their two young children a good Christmas. Money is tight, as Todd Donahue, a clam harvester, had to take several weeks off in peak season to get through the shock of their loss. Patricia Donahue, who is pregnant, stays home with the children. The couple has sought no assistance with Christmas gifts from social service agencies. On Christmas Eve, the children will receive one gift each, and then they’ll do the traditional opening of gifts the next morning. “The kids will get to see their grandparents and aunts and uncles and be happy,” Patricia Donahue said. The Donahues did not discuss the ordeal of the day their son died. Dale Whitmore, president of the Wardtown Mobile Home Park Co-op, which manages the property, remembers it well. Burial expenses set the Donahues back. His cousin, Sherry Branch of Topsham, got a GoFundMe online fundraiser going to help with that. “But they got well behind in their rent,” Whitmore said. The park cooperative board is being patient. 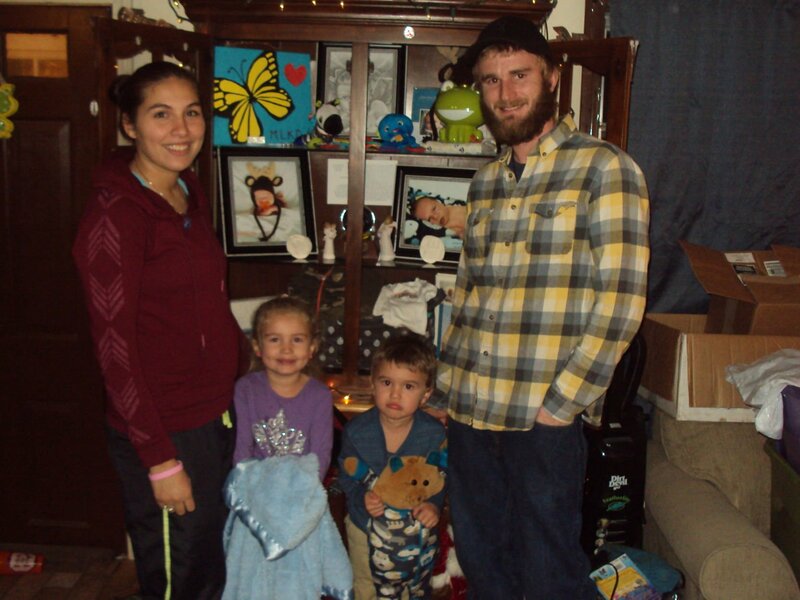 Patricia and Todd Donahue and their children, Raelyn, left, and Tripp, with keepsakes from Mason Donahue, who died at 36 days old from sudden infant death syndrome in May.